Antoine Alaurent, 24, is a French designer who starts design studies in Paris. 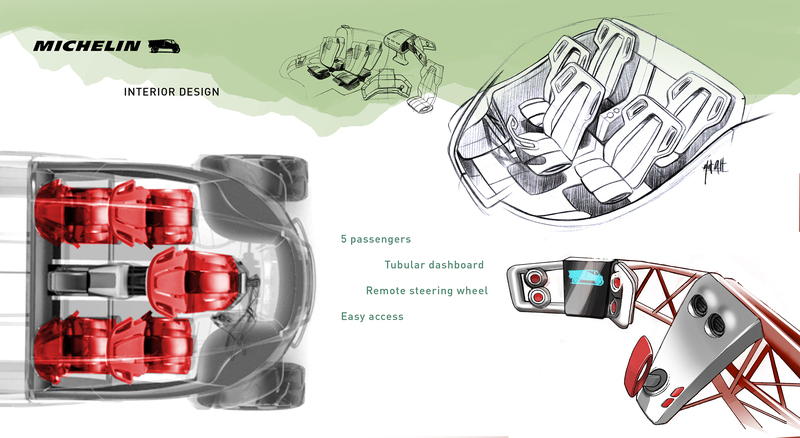 Graduated from Turin IAAD school with a Transportation Design Masters. Passionate, creative and curious and is looking for experience into the world of work. Has always drawn and loves cars and other vehicles. 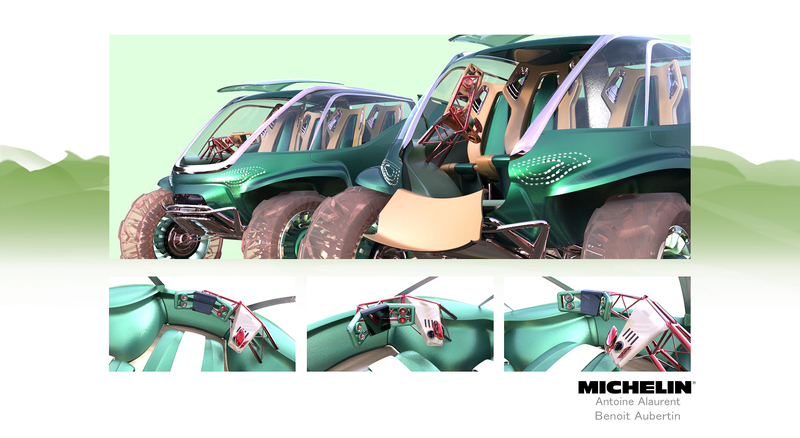 Participation in the Michelin Challenge Design was a great opportunity and an exciting project. 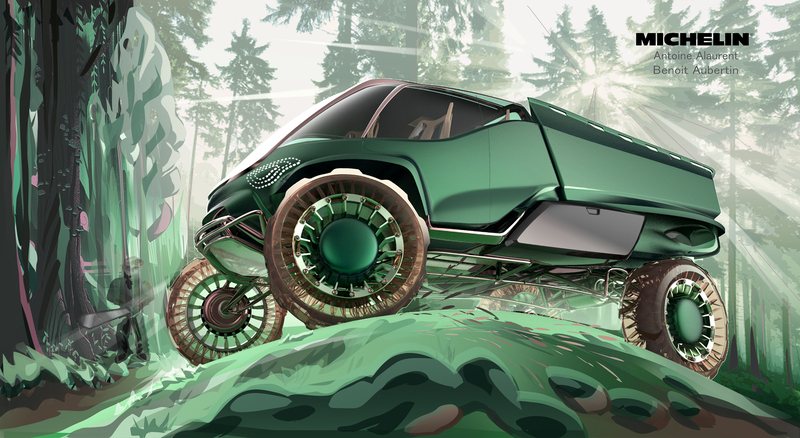 Benoit Aubertin grew up in Pays Basque, where he developed a passion for cars and drawing. Unable to say which one started first, they continue to grow and learn from various experience, nor in the real world, nor imagining what could it become. Enjoying looking for design solutions, he likes creating and experimenting various ideation, from small details on corner of paper to more complete package choice. His passions gained a new approach by learning Alias in Italy, which allow a better and more precise visualization of ideas. But it is still not real enough. 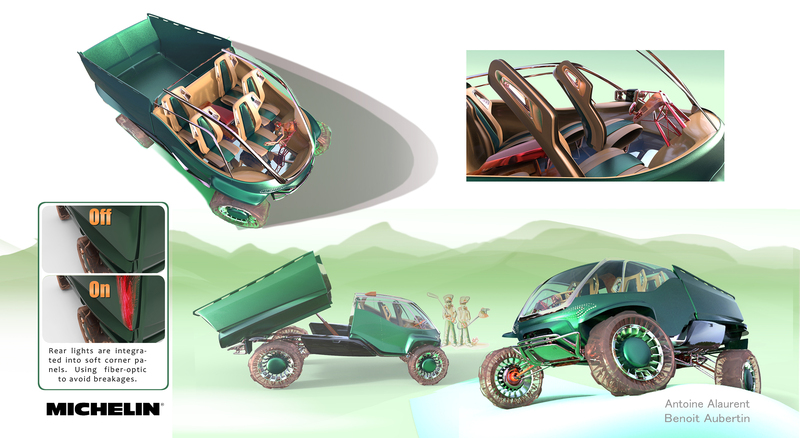 His goal is to work in the automotive industry and to be part of those few people who transform some paper ideas into real cars that people enjoy to drive. 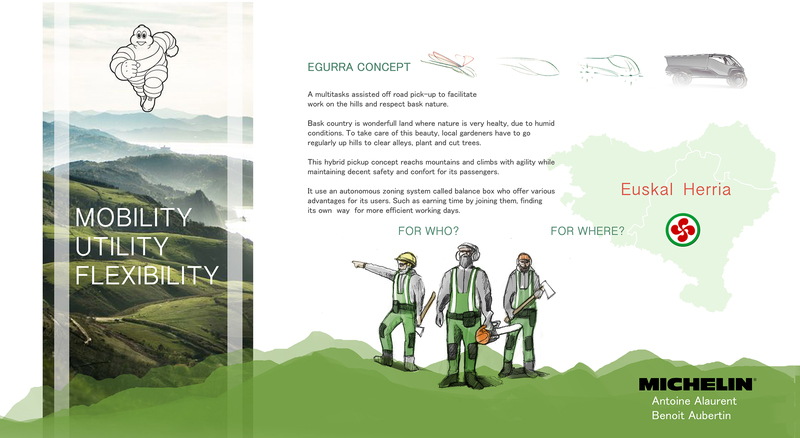 Part of the world chosen for this project is Basque country, a beautiful region where nature as a huge presence, due to a humid climate. This fast-growing environment requires regular attention. Having worked as a gardener, I chose to develop a pickup for gardeners. Taking care of plants has an important human factor, this 4×4 was conceived as an extended tool to facilitate and make the work more efficient by accommodating to its user’s needs. It is hybrid powered with a petrol engine centered in the cabin with an additional electric engine next to the differentials. 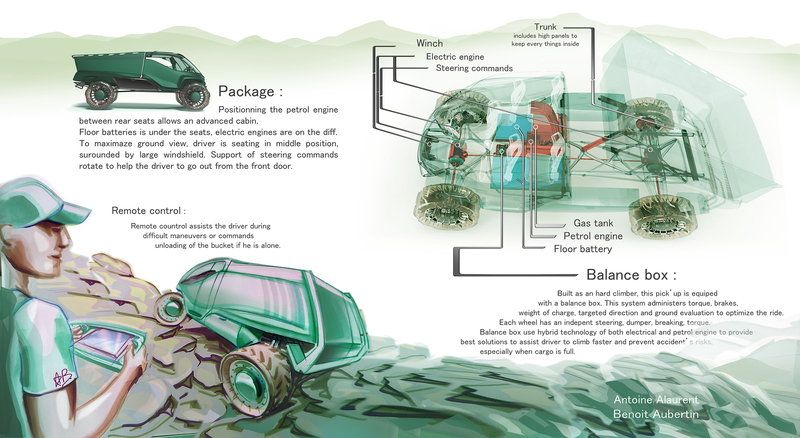 To climb faster and safer, a balance box coordinates torque, brake, suspension with evaluation of the ground to offer maximum ability to each wheel. A local autonomous mode helps woodcutters work by finding a way to join them for less time consuming return. 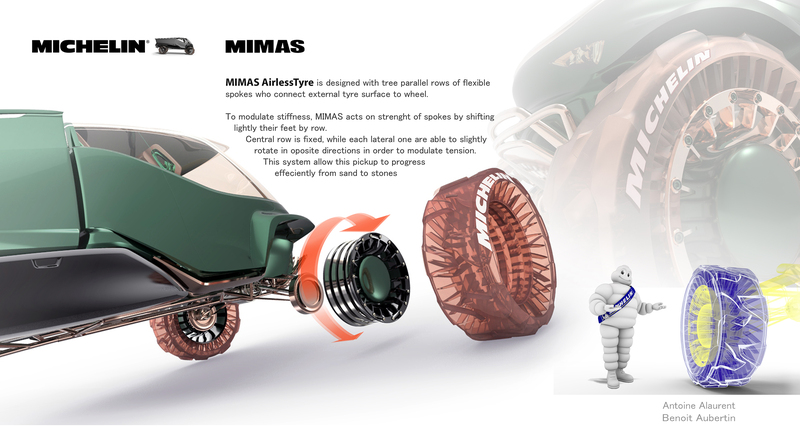 For better moves in various conditions of Pays Basque, from mud to sand or stone, it rolls on special airless tires called mimas. 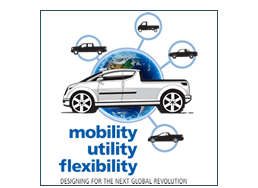 This system impacts on the tension of the tire spokes to regulate stiffness. The cabin is very frontal with a driver position between the front wheels. Windows are very low in the front to maximize the view when climbing on the hills, driver can exit from a door in the front. Skip has high panels to keep everything inside when its moving. Under the trolley, there is a tool box on each side. Rear lights are integrated in soft corner panel with optic fiber to not break light when maneuver.